Charlie Scott was drafted by the Boston Celtics in 1970 but he had already signed a contract with the Virginia Squires of the ABA. Scott was named ABA Rookie of the Year after averaging 27.1 points per game. During his second season with the Squires, he set the ABA record for highest scoring average in one season. However, he became dissatisfied with life in the ABA and joined the NBA's Phoenix Suns in 1972. Scott continued his stellar play in the NBA, representing the Suns in three straight NBA All-Star Games (1973, 1974, and 1975), then was traded to the Boston Celtics. With the Celtics in the 1975-76 NBA season, Scott won a championship ring against the Suns. Scott later played for the Los Angeles Lakers and Denver Nuggets. He retired in 1980 with 14,837 combined ABA/NBA career points. He was inducted into the Naismith Memorial Basketball Hall of Fame in 2018. 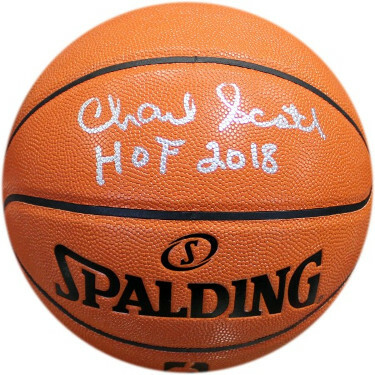 Charlie Scott has hand autographed this Spalding NBA I/O Basketball with HOF 2018 inscription. JSA Witnessed Hologram-ITP (In the Presence) Hologram and Certificate of Authenticity.